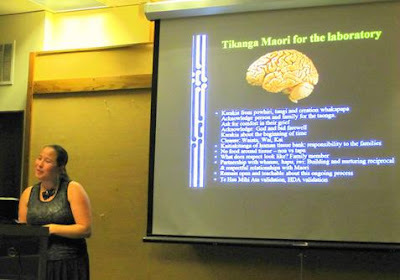 This evening I had the great honor of attending a lecture by Maori neuroscientist Melanie Cheung on her research into Huntington's disease, her efforts to apply Tikanga Maori (Maori ways of thinking, being, doing) to her work with human brain tissue in a culturally safe and sensitive way, and her experience in both Indigenous and Western science. Cheung's lecture was part of the Indigenous Wellness Research Institutes annual celebration and having just finished Gregory Cajete's book, Native Science, and then finding a fantastic article by Cheung on Indigenous science, I was very much looking forward to hearing Cheung in person. The results...she was FABULOUS!. Her research is fascinating and her journey to apply Tikanga Maori to her work is nothing less than inspiring as it invites a deep respect and sensitivity for people, protocol, and life back into science, something that has been lacking in Western science...well for centuries. As opposed to the Western worldview in which science and spirituality don't get along so well, in Indigenous Science science and spirituality are often one and the same. In fact, Cheung considers her ability to bridge the two worldviews as a benefit as it allows for more open-mindedness and more diverse perspectives in both asking and answering research questions. Add to all this a great sense of humor and fantastic storytelling skills and you've got one really fun, really inspiring evening.